To send an e-card for Valentine’s Day (or any day), visit our e-card page, select an image, write your message, and press send. A dive into the University of Iowa Libraries’ digital archive always yields interesting materials — items that, despite their age, hold timeless value. 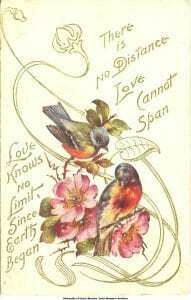 Using images from the Iowa Digital Library, staff in UI Libraries Special Collections have assembled a selection of 11 Valentine’s Day e-cards. The UI Libraries offers these digital greetings as an open-access resource for anyone who cares to send an e-card. The featured images, taken from cards dating as far back as 1907, were selected from five of the many digital collections in the Iowa Digital Library. The Iowa Digital Library is coordinated by the Digital Scholarship & Publishing Studio and offers more than a million digital objects created from the holdings of the UI Libraries and its campus partners. Eight of the Valentine’s Day e-cards are from the Mary Noble Photograph collection, donated by Mary Noble to the UI Libraries’ Iowa Women’s Archives in 1993. This collection includes items from 1870 through 1979 and consists of postcards, cabinet cards, panoramic photographs, and other types of photographs. The collection also includes papers that provide context for the photographs, including information about professional women photographers in Iowa. The collection offers insights for those interested in photographic depictions of life in Iowa, including buildings, street scenes, and recreational activities. In addition, printed materials from the 1940s provide considerable information about African Americans living in Des Moines during that era. The images in the Iowa Digital Library are open access, which means they are available, free of charge, for download and use (with citations). The UI Libraries is committed to offering open access content in order to make materials available to all. Other open access resources at the UI Libraries include Iowa Research Online – a repository that preserves and provides access to the research and creative scholarship created by the University of Iowa’s faculty, students, and staff — and Digital Editions — UI faculty and graduate student research published online, utilizing the power of digital formats to convey the impact of their scholarship and expand reach. To send an e-card for Valentine’s Day (or any day), visit our ecard page, select an image, write your message, and press send. Offline? Send us an email or see our other contact options.